Motorola Solutions continues to innovate devices and solutions, with purpose-driven designs, that set them apart from generic device manufacturers. Here is a firsthand report on Motorola's latest developments, from their recent NYC event, "The Future of Retail." It is a dynamic time for retail. The pace of change has accelerated, driven by the adoption of smart phones and tablets by consumers and their subsequent use for comparison shopping and showrooming; the push towards integrated omni-channel experiences; social networking; and other dramatic developments and forces. So it was with great interest that I participated in Motorola Solution’s “The Future of Retail” event recently. 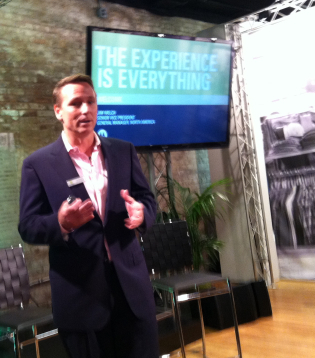 Jim Welch, Motorola Solution’s SVP and GM for North America, started it off by saying, “The Experience is Everything.” He made a point that this applies not just to the customer’s experience, but also to the associate’s experience. Good experience and good user design is hard to create. To get it right takes a lot of dialog, trial, and observation of solutions and services in action. This happens to be something that Motorola has proven to be pretty good at. They have to be if they want to stay out of commodity pricing hell, with low cost producers nipping at their heals! Offering a total solution, purpose-specific, field-refined designs, good integration, and strong partnerships—these are required survival skills Motorola has cultivated. Welch mentioned that they spend about a billion dollars a year in R&D across all of Motorola Solutions (their retail business represents about 11% of overall revenue). A good chunk of that billion in R&D spending is leveraged across lines of business. We saw several examples of technology from their public sector business being applied in their retail business. He also highlighted the key themes they are hearing from their retail customers: knowing who is in the store, meshing online and physical experiences, avoiding out-of-stocks, and arming the store associates with at least as much knowledge about the merchandise as the shopper has access to. Where Motorola would like to go with this: if the user has opted in, and decides to explicitly make their presence and identity known, then the store associate may be able to not only greet the shopper by name, but also know their buying history and preferences as well. This is sometimes touted as way to get us back to the type relationship that local store owners had with their customers, back when the store proprietor knew their customers almost like family—keeping up with the major events of their customers’ lives, their habits, likes and dislikes. With today’s highly mobile and anonymous society and transient workforce, that has been lost. I’m skeptical that technology alone can really get us back to that type of relationship. But if done right, solutions that help associates know the customer and connect to them better should be possible. As with anything involving human emotions and relations, this is a tricky business. For example, people might get creeped out if some guy at the store they’ve never met knows so much about them. With the proper opt-in and explicit understanding, those types of barriers can be overcome. This is a new frontier. I expect retailers and solution providers to take years to learn how to really do it right. In August, Motorola will release WiNG3 5.4 WLAN, which will provide (among other things) analytics for WiFi usage by shoppers (see Figure 4). These analytics gather data from across the whole chain which can be viewed in aggregate or drilled down by store, to see the types of devices being used by shoppers, the top URLs visited, and perhaps most interestingly the top search terms used while in the store. Seeing what types of items people are searching for online while in the store could provide merchandisers some insights into potential missed opportunities in brands, models, and colors that people are looking for, that the store might not currently carry or that are out of stock. 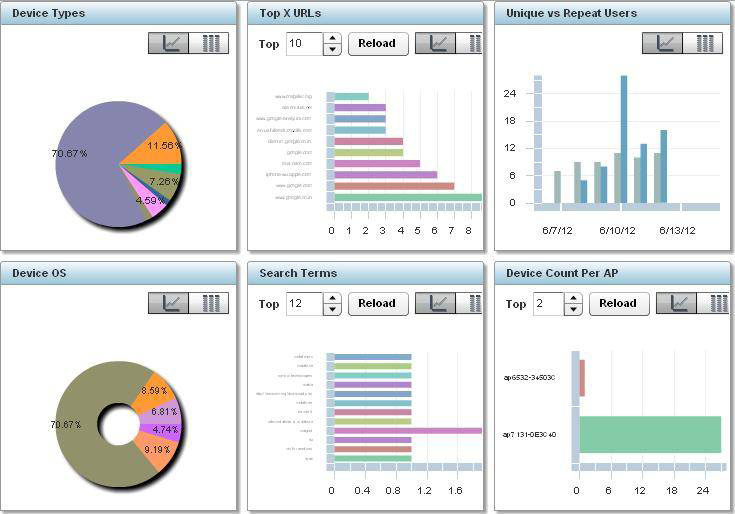 You could also see how many people are viewing your competitor’s sites. Motorola also showed their Modular Access Point, which provides not only the normal WiFi communications, but can incorporate a video camera. This way you can leverage the existing infrastructure to provide video for security or analytics. Their AP includes QoS which reduces latency and jitter in streaming video or VoIP. 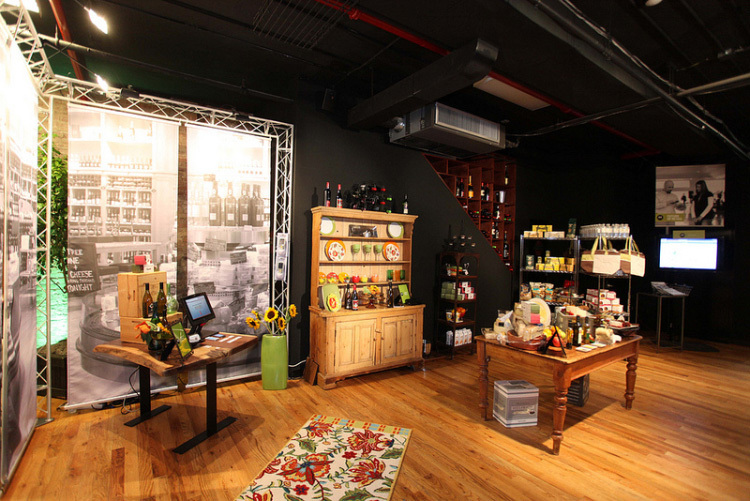 A perennial challenge for retailers and their suppliers is ensuring proper execution of the setup of the store’s displays and stocking shelves to match the plan, whether for promotions or everyday displays. Motorola’s Mobile Planogram helps address this by displaying on a tablet to the associate or manufacturer’s rep exactly how the shelf should be laid out, including the quantities. And they can re-order items right there from the tablet with a couple of taps. Once they are finished stocking the display, the associate or rep can take a photo to show they have executed properly. Even though only a small percent of these photos may actually be checked, it can positively impact performance because people are more conscientious when they know their work is being recorded and randomly checked. In the future, Motorola may be able to use their video analytics (see below) to let the system see if the execution was done properly for 100% of the display setups being monitored. Motorola demonstrated their video analytics integrated with workforce task management. 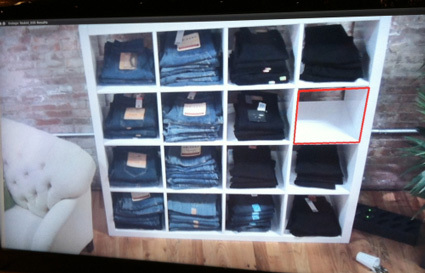 The video analytics demo detected when the last pair of jeans was removed from the shelf and send out a restocking task to several associates on their SB1 devices (see part two of this article for more on the SB1). If no associate accepts the tasks within a given period of time, it is escalated and the store manager can take some action to make sure the task is being done. The associate indicates on their SB1 once the task is completed. The manager can use their tablet to look at all the outstanding tasks, drill down and do other things to manage the tasks. Most workforce management tools provide things like planning, scheduling, time and attendance, and promotion management. These generally stop at the store manager. Motorola brings workforce task management all the way out to the device and individual store associate, delivering “the last mile.” This is not unlike how modern warehouse solutions direct the workers’ tasks by handheld or voice devices today. By taking this approach, Mobile Work Force Management can provide workforce performance metrics based on the actual execution of each task, such as the time-to-complete tasks, time spent at breaks, and so forth. This can also be used to optimize and load balance the workforce, putting associates where they are most needed, and seeing which tasks take up the most time, to see where there might be inefficiencies that can be reduced or removed. The video analytics piece is a good example of how Motorola has been able to leverage R&D from another part of the company. Originally video analytics was used in their public safety business and they ported it over for use in the retail business. The technology is still in development. Currently their video analytics cannot tell if an item is put in the wrong place. It just tells if a location is empty. Based on the planogram, it tells you what is supposed to be restocked in that location. Motorola is trying to develop the technology to recognize individual prepackaged goods, which could help in recognizing misplaced items. They believe that the place to start with video analytics is helping CPG4 vendors whose representatives manage the stocking of the shelf. 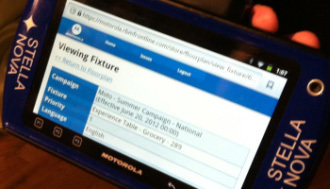 Motorola is conducting a video analytics pilot in the grocery department of a major retailer. They are currently getting 90% accuracy in sensing low or OOS5 situations. The retailer can set restocking policy based on the item or category. For example, the retailer may restock the produce section more often to keep it full. 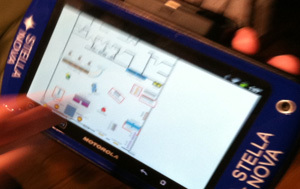 Motorola expects to ship video analytics around the end of 2012 and Mobile Work Force Management this summer. In Part Two of this article, we will look at Mobile self-scan, Mobile POS, and what Home Depot is doing with Motorola’s technology.